Designing and Illustrating a Film Poster. The project first came about by way of a very nice recommendation from an illustrator friend of mine, Mark Raats to the films Director, George Isaac. Mark was originally connected to the project early on. Having difficulty fitting it in with his workload, he asked me if I could carry on from where he left off. I jumped at the chance to work on the project, and so it began. Mark had already created some great concepts for the poster design that everybody loved. Coming to the party a little late, George explained to me he really wanted the poster creating within a pretty tight time frame in order to get the marketing the film started. After working on some updates and revisions to Marks concepts, it was soon obvious that there wasn't going to be enough time to really give this illustrated poster the justice it deserved. I suggested to George that we could create a cool looking teaser poster for the film, get it out there and then concentrate on the main poster after that. George quite liked the idea but was not completely convinced and wanted to see my ideas. So we talked about the essence of the film in depth and the feel he wanted. London was a big part of the film and one of the early tag lines was "Who Lit The Fuse", I had a production photo of Rufus Sewell running in the streets of London that looked particularly strong, it's also one that Mark used in his early concepts. So, I started sketching out ideas and once they were drafted out I emailed them out to George. I redesigned the film's title logo and I created the artwork in various formations needed for the advertising of the film. The One Sheet/Roadside Outdoor Poster, A British Quad for the cinemas, a 96 Sheet backlit billboard and the T Side for the London buses. After the final artwork was approved and set in motion for the advertising campaign I decided to revisit the original illustrated concepts for the poster and created this fully illustrated version of the poster, primarily as a thank you gift to George and Mark for their sheer awesomeness and to also satisfy my own desire to see the job completed... I think it serves as a nice companion piece to the Red Poster design fleshing out the excitement of the film and it's characters. Creating artwork (key art) for the advertising of a film in cinemas has always been a high on the personal goals list for me and despite creating a one sheet illustration for Daryl Goldberg's 'Made For Each Other' in 2008 and the film related personal / gallery work I have been producing, this project ticked one of my boxes for sure. With a major advertising push by the Director George Isaac and Producers of the film meant it has made it's way around the UK in a big way over the last couple of weeks. Living in New Zealand, I haven't been able to see the posters first hand but thanks to my friends and fans I have been able to see it in their snaps of ATTAM poster sightings around the UK on Bus Shelters, in the London Underground, sides of double decker buses... I'm just waiting on a photo of the huge 96 sheet backlit billboard that went up last weekend! 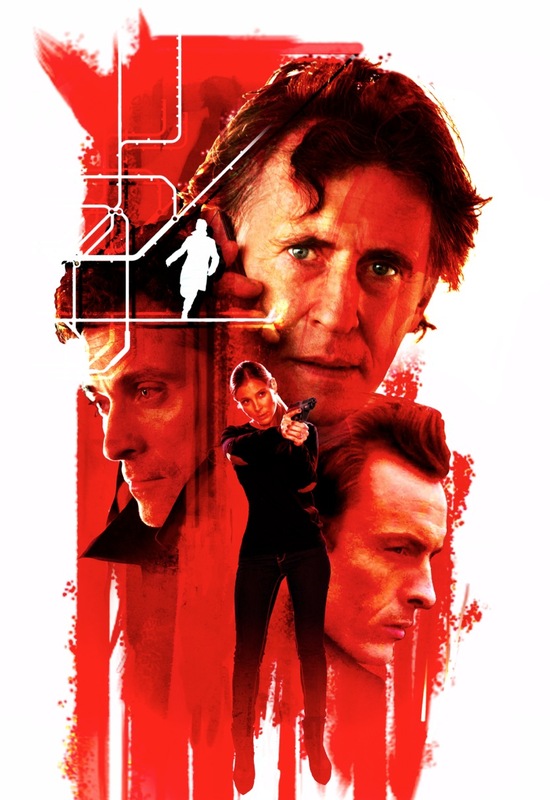 All Things To All Men was released in cinemas across the UK on April 5th Starring Gabriel Byrne, Rufus Sewell and Toby Stephens.